At Romeo Guest Associates, Inc., we know that Durham, NC athletic and recreation centers need to be built to last — they need to be able to handle large crowds, energetic children and heavy sports equipment. Our professional staff thinks of the subtle details that can make your gym or sports center a durable, enjoyable place to be for years to come. Trust our commercial construction company with design-build, general construction, preconstruction and construction management service needs. We strive to build lasting relationships with our clients by providing top-quality construction services for our Durham athletic and recreation projects. Our commercial construction company is known throughout the state for our integrity, professionalism, and our detail-oriented approach. Our management staff, at all levels, is attentive to each client and their construction endeavor. 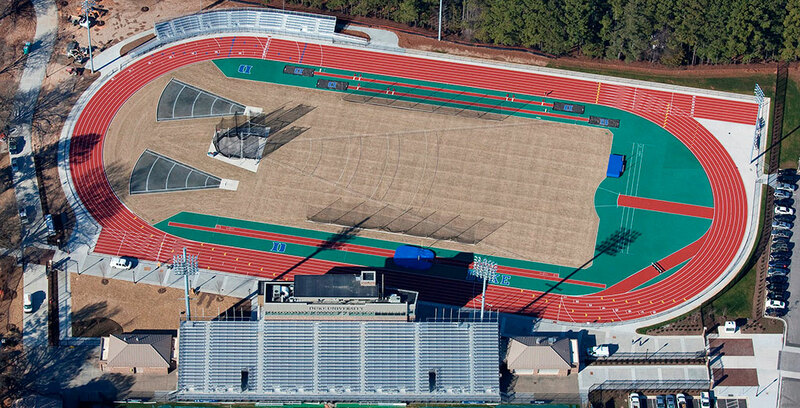 If your organization is considering building a track and field facility, gym or recreation center in Durham or beyond, reach out to Romeo Guest. With more than a century of experience, you’re sure to be pleased with the results our staff can provide! Contact us today at 919.683.1701 to learn more. Providing exceptional construction services for athletic and recreation centers in Durham, Raleigh, Morrisville and RTP, Romeo Guest Associates, Inc. is proud to serve the NC Triangle area.